Wells Fargo opened a home mortgage office on Washburne Avenue in downtown Paynesville on Feb. 1. Wells Fargo opened a home mortgage office on Washburne Avenue in downtown Paynesville on Feb. 1. 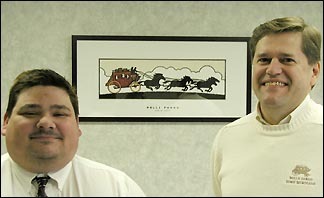 Home mortgage consultants Joseph Rishkofski (left) and Doug Kuehnast (right) will staff this branch. Rishkofski specializes in bad credit loans and handles loans to people with a less-than-perfect credit history in a 150-mile radius of Paynesville. He has 10 years of experience with mortgages and will be in the Paynesville office full time. Rishkofski, who lives in Eden Valley, finds helping people with bad credit very rewarding because he gets to assist people who might have thought that they couldn't buy a home or refinance. Kuehnast, who has 16 years of experience, will split his time between Paynesville and Willmar. He will handle customers with "A" credit. The decision to establish an office in Paynesville came in part because the company already has a number of customers in the area, especially for manufactured homes and recreational vehicles, said Kuehnast. The local office will only handle mortgages, but can refer clients to Wells Fargo banks in Willmar, St. Cloud, or Litchfield for other financial services. One of the strengths of Wells Fargo, in addition to its strong brand name, is the company's variety of mortgage options and programs, said Kuehnast. The company does one out of every 15 mortgages in the country, he added. "We believe in clients for life," said Kuehnast. "We want to do people's kids, grandkids, neighbors, and coworkers. We've been around for 150 years and we want to be around for another 150 years." The company also is a leader in technology, said Kuehnast, with a user friendly website for its customers. Rishkofski said they carry laptops to appointments to give instant feedback to clients. An office staff of two people will assist Rishkofski at the Paynesville office at 102 Washburne Avenue. Office hours will be from 9 a.m. to 6 p.m. from Mondays to Fridays, 10 a.m. to 4 p.m. on Saturdays, and by appointment on Sundays. The local office will hold a grand opening on Saturday, March 2, from 12-3 p.m.